Larger size Electric Drill, still portable. I am going to be talking about here the larger electric drill size that is just about on the limit of being able to handle with one hand only. The smaller ones used for holes up to say 8mm to 10mm can easily be held with one hand. These drills may only go up to 12mm with a few being larger, but the pack a lot of torque, and so the have to be held in both hands to stop them spinning if the grab. Electric drill - "D" handle drill, two gear speeds, two electric speeds, reduction in right angle accessory. They are not the largest of portable electric drills around, but are the largest seen in the typical DIY and home improvement fans tool shed. They are slower revving than the smaller drills with more power and low speed torque. Electric drills this size you usually pick up for a specific job. They have more power and slower speeds than the previous drills. The lower speeds make them ideal for the big mixing stirrers that ceramic tilers and plasterboard fixers use. Slowly turning mixers don't entrap air as much as faster tools. This one started out it's life as a standard drill with a 13mm chuck. It has two geared speeds and two electric speeds and a reverse. I put the right angle drill attachment on it years ago along with a 16mm chuck. The attachment makes it possible to drill in confined spaces, like between close rafters or inside a roof space down through the top plate of a wall. The angle attachment can be reversed in it's mounting for slow or high speed also. We always have it set to low. One huge bonus that we soon discovered with this layout was that because of the distance from the center of the bit to the handle, there is enough leverage to just about stall the motor if the bit jams. The large mixers that plasterers use soon get weighted down with dried cement etc. To stop this have a large tub of water nearby and spin the tool in it after every use. I leave mine in the water until clean up time. 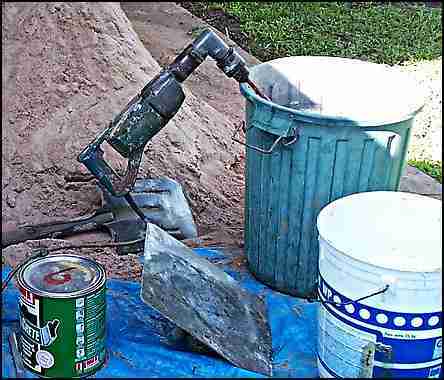 I am using my big electric drill here to mix a sand and cement mix with a waterproofing and strengthening additive, Bondcrete. There are now dedicated drills for tradies who do just this sort of work, They have two nice grab handles on either side and the gearing is just right for the heavy mixing they have to do. Drilling larger holes through steel, they can grab and twist your wrist or worse. Here are a few tips to help stop this. If you can, use a tree bit or step bit. As I have said elsewhere, they are magic. The drill bit is spinning clockwise. It suddenly jams and stops. To compensate the body of the drill wants to spin ANTI-CLOCKWISE. That is the direction you should be bracing against. Electric drill- Slow speed Makita drill. Larger and longer side handles are what the larger industrial drills use. They give more leverage and control. If you have access to a welder consider making a longer, pipe handle up, that screws into the side handle threaded hole. I made up one for a specific job once that was "L" shaped to hook on to the "I" beams we were drilling. Thistopped completely the wrenching when the drill wanted to grab. The drill in the photo is a 12mm Makita DA6300. It is a two speed reversible drill. Get this, the speeds are 300rpm and 1200rpm. It comes with an extra long side handle. According to the specs it has "Triple reduction gearing for maximum power". I believe them. When I see stuff like this coming on the market I think of all the jobs we have struggled on, when a modern tool would make it so easy. Depending on the layout of your handle, you may be able to put a bar or pipe through the "D" of the handle. I can't do this real well with mine as it stops access to the trigger switch. I once hired a magnetic drill press to drill large holes in long, heavy, steel beams . It is more of a workshop tool. They are quite heavy with the electro magnet part probably about half of the total weight. It made a hard job easy. It worked off single phase (ordinary household power) and we just carried it to the steel we were drilling. Far easier than dragging the steel to a pedestal drill. << BACK: Medium sized drills.